In mid-October, Elkhead Reservoir appeared much lower than normal in some places where the shoreline changed dramatically, but in reality it's only about 2 feet below average. Elkhead water came in handy for some water users during this dry year, including Tri-State and the endangered fish program. 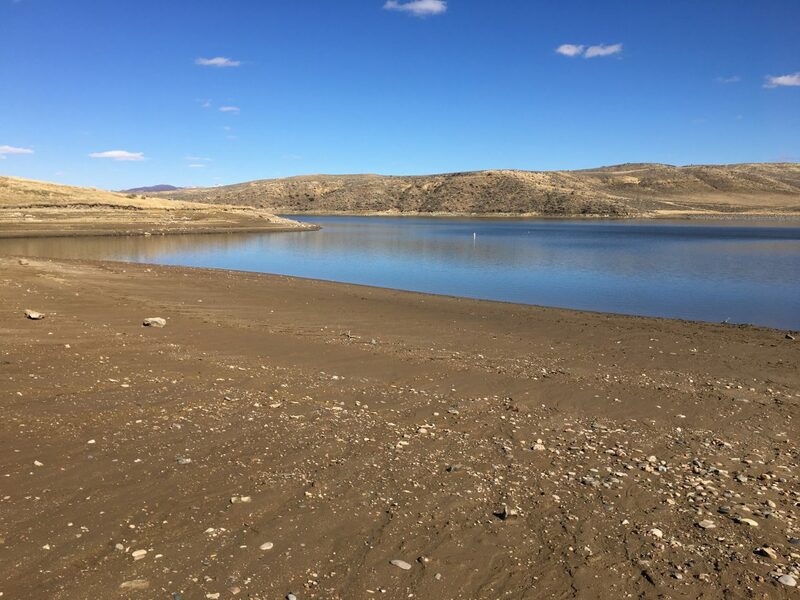 CRAIG — For many Moffat County residents, Elkhead Reservoir is a fun place to play and fish during the summer months, but it also serves a very serious purpose in the world of water users. The reservoir stores up to 25,656 acre-feet of water, offering a sort of insurance policy against drought, for everything from residential water use to power plant operations to endangered fish populations in the Yampa River. And, in dry, hot years like 2018, owners of Elkhead water were glad to have the backup. This “teacup” graphic illustrates who owns water stored at Elkhead, measured in acre-feet or AF, both before and after it was expanded in 2006. One acre-foot equals about 326,000 gallons of water. The Recovery Program also has the option to lease an additional 2,000 acre-feet from the River District, bringing its total to 7,000 usable acre-feet of water. Drought poses some obvious challenges to native fish populations. Colorado pikeminnow can reach lengths of 2 to 3 feet, according to Tom Chart, director of the Recovery Program, and low flows in the river can make it difficult for them to swim. Adding insult to injury, non-native fish populations, such as small-mouth bass, tend to thrive in drought years and prey on native fish. Reservoirs exist to create a buffer against drought, but the Yampa River has very little storage capacity compared to most rivers in the Colorado River system. Though the Yampa accounts for nearly one fifth of the water that feeds into the Colorado River, reservoirs in the Yampa River drainage account for only 2-percent of the total storage in the state of Colorado, according to Kevin McBride, district manager for the Upper Yampa Water Conservancy District. The free-flowing nature of the Yampa River is what makes such good habitat for native fish, which are adapted to extreme flow conditions, Chart said. “However, current municipal, industrial, and agricultural demand diminishes Yampa River summer flows and, therefore, increases the effects and frequency of the low summer flow conditions,” he added. The city of Craig draws all its municipal water from the Yampa, and Craig Station is a major industrial user in Moffat County. The power plant relies on Yampa River water to make steam, a key ingredient for generating power with coal. According to a 2004 report on the Yampa River Basin, Craig Station historically draws an average of “15 to 16 cfs, with daily diversion rates of up to 45 cfs,” from the Yampa. Tri-State, the operator and partial owner of Craig Station, declined to provide current figures about the plant’s water use. One cubic foot per second, or cfs, is equivalent to 646,320 gallons of water per day, or nearly two acre-feet. At 15 cfs, Craig Station would use about 9.7 million gallons from the river daily. For comparison, the city of Craig diverts about 6 cfs and treats about 4 million gallons of water per day during peak summer usage. From Elkhead, it used 341 acre-feet of water, according to the River District, though it owns much more. Tri-State secured 2,500 acre-feet of water several years ago to add to its existing portion of an 8,408 acre-foot pool shared by owners of Craig Station Units 1 and 2, according to the River District. Additionally, Tri-state owns 4,000 acre-feet of storage in Yamcolo Reservoir and 7,000 acre-feet in Stagecoach, according to the 2004 Yampa River Basin report. This story has been updated to clarify that Tri-State secured the additional 2,500 acre-feet of water several years ago, not when the reservoir was expanded in 2006.